There are two specific challenges we face with our comrades who get out of prison and want to stay politically active. First, the difficulties of balancing work, school, politics and general home life. Second, the overlap between friendship and politics. It is important that we address these challenges to help our comrades follow through on their pledges to serve the people after gaining their freedom. So far we have been less than successful in this regard, and many comrades fall out of touch with us, only to re-emerge when they are locked back up months or years later. In a country with such a relatively low number of active, committed anti-imperialists, losing these comrades to the streets is a significant blow to our work. As we expand our Re-Lease on Life Program, we are working to address specific challenges with life on the streets in the belly of the beast. There are few resources for released prisoners, and without family or friends to provide support it's very difficult to find housing, get a job and provide for basic necessities. There are few studies of homelessness among released prisoners, but those that we've found suggest that at least 10% of parolees end up on the streets without housing after release. (1) The numbers are probably higher; sleeping on a friend's couch is not a long term solution but it won't get you counted as homeless in these studies. Unfortunately MIM(Prisons) doesn't currently have the resources to provide much help in the area of basic needs for released prisoners. We do have some resource guides for some states, and we can help you think through the best plan for your circumstances. But our ability to help in this area is limited. The rest of this article focuses on people who are released and are able to meet their basic needs. If you have a release date coming up, let us know so we can help you make a plan for the streets. Behind bars life is very regimented, with little room for any decisions about how to organize your day, except when you are locked in your cell. And even there, your options for how to spend your time are very limited. You don't have to keep a schedule because the prison keeps it for you. So one of the problems prisoners face when they hit the street is the vastness of opportunities and choices, and the lack of structure. Many comrades will want to pursue some education, while also finding a job, and attempting to reconnect with family and friends. This means a lot of choices and opportunities, and structured days are necessary to make them fit together. The demands of family and friends can be especially difficult during the initial months post-release after so long with social interactions closely monitored and limited. Friends, family, school and work are all institutions that are deeply ingrained in and supported by our culture. There is no support for doing revolutionary organizing. That is why Re-Lease on Life is so important. People have a hard enough time doing the normal things they need to do to get by as former prisoners, especially as felons. If you just go with the flow, you'll find your time just flies by and you don't put in any political work. To participate in the Re-Lease on Life program you need to make a commitment to political work upon release. But most people will need to keep this commitment minimal at first, so that you can focus on getting established with a plan for meeting your long-term needs as an individual, while keeping a connection to the movement. It's important to think about the future. If you get government assistance, or have a part-time hustle when you get out, how long can that last you? If you don't have job skills or a college degree you should consider school and look into scholarships. On the other hand, it may be worthwhile to focus initially on just making some money before you consider starting school. Think about where you want to be in a year or two. If your political work is limited by time now, how can you free up more time in the future? One way is by getting into a career path where your income will grow with your experience. Another consideration when looking for jobs is, how can it support my bigger goals? If you work in food service, you save money by bringing home leftovers. If you work at a copy shop, you get discounts on fliers and literature. Getting a manual labor job might help you meet your physical fitness goals. If you work at a security job you get paid to do your political study, leaving your free time to do outreach work. Whatever your plan is, you need to start thinking about your time as a budget. You have only so much each week, each day. Determine how much you really need for the necessities in life and then schedule that time. A week has 168 hours in it. If you sleep 8 hours a night that leaves 112. If you need 2 hours a day to cook, eat and take care of persynal hygiene, you are down to 98 hours. Take at least 5 hours a week to deal with other persynal stuff like finances, cleaning, and organizing. You want to work out at least 4 hours per week, maybe more like 8. Now we have 85 left. If you work full time you've got 45, plus transit time, so make that 40. If you're going to school too, you could probably use up most of that 40. If you have regular appointments with your parole officer, doctor or counselor, that will take a few hours. In your best case scenario you might have 40 hours to spend on socializing, relaxing and doing political work. Realistically, finding 15 to 20 hours a week to do political work with a normal bourgeois life is an ambitious goal that requires discipline and good planning. Keep in mind that even if you only have 5 hours a week free for political work, that is 5 hours of work getting done in the interests of the oppressed. Any time you can set aside for this work is good. And when you first hit the streets this will be easiest if you can set aside that time on your schedule so that it is always the same day/time. For instance, you could say that Tuesday and Thursday nights you will do political work from 5-8 p.m. Block it off on your calendar and tell your friends you have appointments or classes at those times (see below). Working this into your schedule as a regular thing will make it much easier to maintain your activism. If you give up and stop doing political work, chances are good that you will never take it up again. The revolution can't afford to lose good activists like you, so don't let that happen! Just as challenging for many former prisoners as managing time is managing money, and the movement needs both. Don't fall into Amerikan consumerism. Imperialism has kept itself going by building a consumerist culture at home to keep capital circulating. 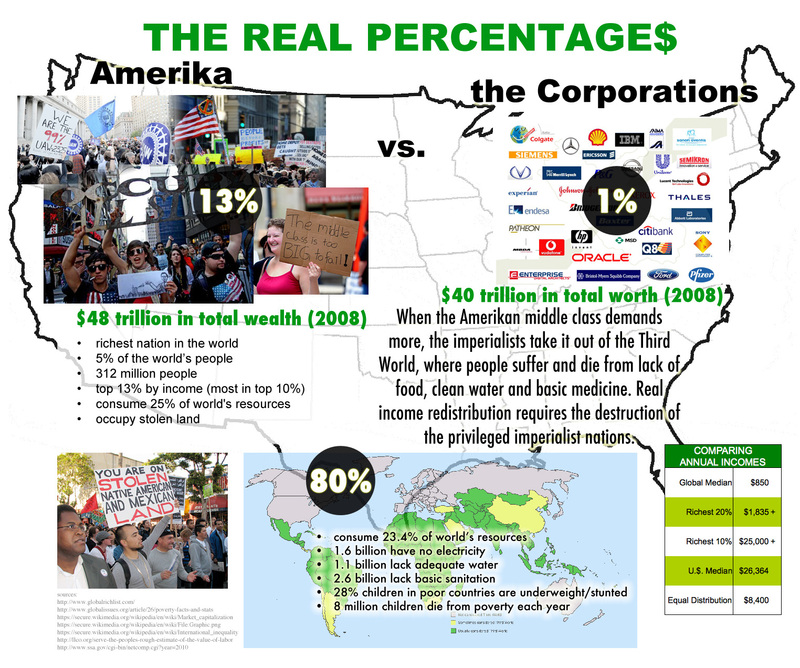 What that means is that a typical Amerikan lifestyle involves far more consumption than is necessary (or even healthy). Having your own apartment, your own car, a cell phone plan, and others preparing your food for you are just some obvious examples of things considered to be "necessary" expenses justifying the so-called "high cost of living" in this country. Seek out others who you can share expenses and cost-saving tips with. Extravagant spending is often a social behavior. Many recreational things like cable television, alcohol and cigarettes become habitual expenses. Rest and recreation are important, but try things that are more healthy and cost less, and if you do want to splurge, make it a special reward, not a daily expense. One of our strengths in this country is that Amerikans get paid extremely high wages. By keeping expenses low, you'll find that you can get by on a part-time job, leaving you with more time to do what is most important to you. Remember, even if you're making minimum wage you are in the top 13% income bracket in the world. Don't use poverty as an excuse, when your wealth and privilege are really what's holding you back from doing political work. Related to the challenges you will face with managing your time on the streets is the social demands of family and friends. The overlap between friendship and politics is something that most people don't consider. In fact, in this country we are encouraged to think about politics as something we must share with family and friends. But MIM(Prisons) does not agree with that view. We live in a country where most people have a very strong material interest in the status quo, and so they will oppose anti-imperialist politics. The chances of winning them over to the side of the revolution are very minimal, and there is generally no need to destroy relationships with family and friends in the name of this struggle when there are so many other people out there we can try to recruit. Also, because of security concerns in this country, exposing your politics to family and friends can put you at a real risk, especially if you are on parole. If there's one thing you should have learned being locked up, it's that snitches are everywhere. There is nothing wrong with having friends who don't share your political convictions, you just need to avoid talking about politics with them or only talk about smaller points of politics, without raising suspicion. This doesn't mean you can't share your political views with friends and family who show that they are likely to be interested and agree, but be careful because once they know your views and the work you do, you can't take it back. When you are locked up in prison the government has a lot of information about you and knows your every move. So behind bars you can only control your security to the extent that you keep your mouth shut on the yard and don't share information about the political work you are doing with people who might use it against you. On the streets things are a little different. Although you might have to report in to a parole officer or allow the state to track you in some other way as a term of your release, you have a lot more freedom about what information you do and don't share with people and with the government. You are under no obligation to tell anyone about the political work you do, and in fact you should do your best to keep this private from people you know unless you have a reason to believe that they would be supportive. And of course you want to keep it a mystery from the state. This is NOT because we are doing anything illegal, but rather because the state does not like anti-imperialists and will use this as a reason to find or create an excuse to lock you back up. So don't make this easy for them. As a whole, this is a very useful book for anyone interested in understanding the criminal injustice system. It is an excellent aggregation of facts about every aspect of the system - incarceration, policing, the drug war, the courts - making a scientific case that this is really a system for social control of oppressed nations within U.$. borders. Where Alexander falls short is in her analysis of how this fits into society in the broader context. She doesn't actually name national oppression, though certainly this book is clear evidence for the existence of something more than just an attitude of racism. She doesn't take on the question of why Amerikan capitalism would want such an extensive system of prison social control. As a result, her solutions are reformist at best. Starting with the history of Amerikan prisons, Alexander explains how the relatively low and stable incarceration rate in this country changed after the civil rights movement which the government labeled criminal and used as an excuse to "get tough on crime" and increase incarceration.(p. 41) It was actually the revolutionary nationalist movements of the 60s and 70s, most notably the Black Panther Party, which terrified the Amerikan government and led to mass incarceration, murder, brutality and infiltration to try to destroy these revolutionary groups. Alexander's failure to mention these movements is symptomatic of a missing piece throughout the book - an understanding of the importance of revolutionary nationalism. This book does an excellent job exposing the war on drugs as a farce that is only really concerned with social control. Although studies show that the majority of drug users are white, 3/4 of people locked up for drug crimes are Black or Latino.(p. 96) Further, statistics show that violent crime rates are unrelated to imprisonment rates.(p. 99) So when people say they are locking up "criminals" what they mean is they are locking up people who Amerikan society has decided are "criminals" just because of their nation of birth. To her credit, Alexander does call out Nixon and his cronies for their appeal to the white working class in the name of racism, under the guise of law and order, because this group felt their privileges were threatened.(p. 45) And she recognizes this underlying current of white support for the criminal injustice system for a variety of reasons related to what we call national privilege. But this book doesn't spend much time on the historical relations between the privileged white nation and the oppressed nations. J. Sakai's book Settlers: The Mythology of the White Proletariat does a much better job of that. "More African American adults are under correctional control today - in prison or jail, on probation or parole - than were enslaved in 1850, a decade before the Civil War began."(p. 175) It is this national oppression that leads Alexander to draw the parallel that is the source of the book's title: prisons are the new Jim Crow. She recognizes that prisons are not slavery, but that instead prisons are a legal way to systematically oppress whole groups of people. While she focuses on Blacks in this book she does note that the same conditions apply to Latinos in this country. Law enforcement agencies were encouraged to participate in the drug war with huge financial incentives from the federal government as well as equipment and training. This led to the militarization of the police in the 1990s.(p. 74) Federal funding is directly linked to the number of drug arrests that are made, and police were granted the right to keep cash and assets seized in the drug war.(p. 77) These two factors strongly rewarded police departments for their participation. Taking on the court system, Alexander points out that most people are not represented by adequate legal council, if they have a lawyer at all, since the war on drugs has focused on poor people. And as a result, most people end up pleading out rather than going to trial. The prosecution is granted broad authority to charge people with whatever crimes they like, and so they can make the list of charges appear to carry a long sentence suggesting that someone would do well to accept a "lesser" plea bargained deal, even if the likelihood of getting a conviction on some of the charges is very low. After allowing discretion in areas that ensure biased arrests, trials and sentences, the courts shut off any ability for people to challenge inherent racial bias in the system. The Supreme Court ruled that there must be overt statements by the prosecutor or jury to consider racial bias under the constitution. But prosecutorial discretion leads to disproportionate treatment of cases by race. This book goes beyond the system of incarceration to look at the impact on prisoners who are released as well as on their families and communities. Alexander paints a picture that is fundamentally devastating to the Black community. 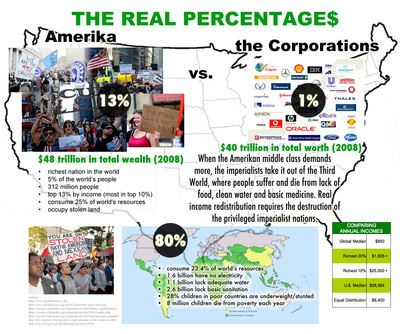 "Nationwide, nearly seven out of eight people living in high-poverty urban areas are members of a minority group."(p. 191) A standard condition of parole is a promise not to associate with felons, a virtual impossibility when released back into a community that is riddled with former felons. Alexander devotes a number of pages to the issue of voting and the prohibition in all but two states on prisoners voting while incarcerated for a felony offense, and the further denial of the vote to prisoners released on parole. Some states even take away prisoners' right to vote for life. She is right that this is a fundamental point of disenfranchisement, but Alexander suggests that "a large number of close elections would have come out differently if felons had been allowed to vote..."(p. 156) This may be true, but those differences would not have had a significant impact on the politics in Amerika. This is because elections in an imperialist country are just an exercise in choosing between figureheads. The supposedly more liberal Democrats like Clinton and Obama were the ones who expanded the criminal injustice system the most. So a different imperialist winning an election would not change the system. On the Amerikan culture and treatment of oppressed peoples Alexander asks: "...are we wiling to demonize a population, declare a war against them, and then stand back and heap shame and contempt upon them for failing to behave like model citizens while under attack?"(p. 165) She argues that the culture of the oppressed is an inevitable result of the conditions faced by the oppressed. And in fact the creation of lumpen organizations for support is a reasonable outcome. "So herein lies the paradox and predicament of young black men labeled criminals. A war has been declared on them, and they have been rounded up for engaging in precisely the same crimes that go largely ignored in middle and upper class white communities - possession and sale of illegal drugs. For those residing in ghetto communities, employment is scarce - often nonexistent. Schools located in ghetto communities more closely resemble prisons than places of learning, creativity, or moral development. ...many fathers are in prison, and those who are 'free' bear the prison label. They are often unable to provide for, or meaningfully contribute to, a family. And we wonder, then, that many youth embrace their stigmatized identity as a means of survival in this new caste system? Should we be shocked when they turn to gangs or fellow inmates for support when no viable family support structure exists? After all, in many respects, they are simply doing what black people did during the Jim Crow era - they are turning to each other for support and solace in a society that despises them. Alexander would do well to consider the difference between racism, an attitude, and national oppression, a system inherent to imperialist economics. Essentially she is describing national oppression when she talks about systematic racism. But by missing this key concept, Alexander is able to sidestep a discussion about national liberation from imperialism. One interesting conclusion by Alexander is the potential for mass genocide inherent in the Amerikan prison system. There really is no need for the poor Black workers in factories in this country any longer so this population has truly become disposable and can be locked away en masse without any negative impact to the capitalists (in fact there are some positive impacts to these government subsidized industries).(p. 208) It's not a big leap from here to genocide. Unfortunately, in her discussion of what she calls "structural racism" Alexander falls short. She recognizes white privilege and the reactionary attitudes of the white nation, acknowledging that "working class" whites support both current and past racism, but she does not investigate why this is so. Attempting to explain the systematic racism in Amerikan society Alexander ignores national oppression and ends up with a less than clear picture of the history and material basis of white nation privilege and oppressed nation oppression within U.$. borders. National oppression is the reason why these oppressive institutions of slavery, Jim Crow, and imprisonment keep coming back in different forms in the U.$., and national liberation is the only solution. Alexander highlights the economic consequences of cutting prisons which show the strong financial investment that Amerikans have overall in this system: "If four out of five people were released from prison, far more than a million people could lose their jobs."(p. 218) This estimation doesn't include the private sector: private prisons, manufacturers of police and guard weapons, etc. The problem with this analysis is that it fails to extrapolate what's really necessary to make change sufficient to create an egalitarian society. In fact, these very examples demonstrate the ability of the Amerikan imperialists to adapt and change their approach to national oppression: slavery, Jim Crow, mass incarceration. 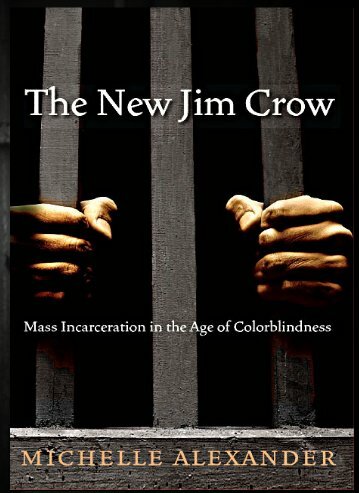 Alexander seems to see this when she talks about what will happen if the movement to end mass incarceration doesn't address race: "Inevitably a new system of racialized social control will emerge - one that we cannot foresee, just as the current system of mass incarceration was not predicted by anyone thirty years ago."(p. 245) But she stops short of offering any useful solutions to "address race" in this fight. This is a good point: successful reformism often ends with a few token bribes in an attempt to stop a movement from making greater demands. And this is not really success. But short of revolution, there is no way to successfully end national oppression. And so Alexander's book concludes on a weak note as she tries to effect a bold and radical tone and suggest drastic steps are needed but offers no concrete suggestions about what these steps should be. She ends up criticizing everything from affirmative action to Obama but then pulling back and apologizing for these same institutions and individuals. This is the hole that reformists are stuck in once they see the mess that is the imperialist Amerikan system. It's not impossible to imagine circumstances under which the Amerikan imperialists would want to integrate the oppressed nations within U.$. borders into white nation privilege. This could be advantageous to keep the home country population entirely pacified and allow the imperialists to focus on plunder and terrorism in the Third World. But we would not consider this a success for the oppressed peoples of the world. A progressive movement against national oppression within U.$. borders must fight alongside the oppressed nations of the world who face even worse conditions at the hands of Amerikan imperialism. These Third World peoples may not face mass incarceration, but they suffer from short lifespans due to hunger and preventable diseases as well as the ever-present threat of death at the hands of Amerikan militarism making the world safe for capitalist plunder. Lost in Translation: Obama on Migrant "Problem"
Set in the year 2161, In Time is a science fiction film portraying a world where people stop aging when they hit 25 years old. At that point they have one year of life in their bank, and living time has become the currency instead of money. When a person's time runs out they die instantly, and so rich people have lots of time, while poor people live in ghettos, living day to day, barely earning enough to survive another 24 hours. Poor people literally have to rush around to earn enough time to survive, eat and pay their bills, while rich people can waste time relaxing or doing nothing, without fear of death. This movie has a solid proletarian premise with the few rich bourgeois people living at the expense of the poor masses. "For a few immortals to live many people must die." The movie's hero, Will Salas, learns that there is plenty of time for everyone from a wealthy man who is ready to die and transfers all his remaining time to Will in order to commit suicide. Will decides to use this time to seek revenge and end the brutal rule of the time rich. When Will buys his way into New Greenwich where the rich live entirely separate from the poor masses, he meets a young woman, Sylvia, who suggests that rich people don't really live because they spend all their time trying to avoid accidental death. This is not a bad point to make: capitalism's culture is bad for everyone, including the bourgeoisie. But the case of Sylvia is a pretty good example of what happens in real life: only a very few of the bourgeoisie will commit class suicide and join the proletarian cause and the youth are the most likely to do this. 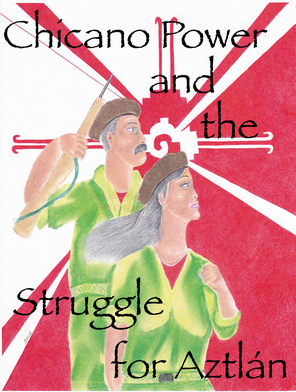 Sylvia and Will set out to steal time from Sylvia's father's companies and redistribute the wealth to the poor people. They plan to distribute time in such large quantities so as to bring the entire system down. This is where the politics of the movie fall apart. Capitalism will not be ended with a quick massive redistribution of wealth liberated from the banks by a few focoist fighters. The In Time world includes police who enforce the system. The Timekeepers work for the wealthy to ensure the poor never escape their oppression. But the Timekeepers seem to have very limited resources and staff so it's not so difficult for two people to out run and out smart them. And except for one key Timekeeper, the others are happy enough to just give up and stop defending the rich. Under capitalism the ruling class understands the importance of militarism to maintain their position and they won't trust enforcement to just a few cops. In another interesting parallel, In Time includes a few characters who play the part of the lumpen, stealing time from the poor. At one point, the leader of this lumpen group explains that the Timekeepers leave them alone because they don't try to steal from the rich. History has plenty of examples of a few focoists setting out to take back wealth to help the people and ending up in prison or dead, often bringing more repression down on themselves and the masses. A quick action to liberate money from banks will not put an end to the system of imperialist repression. True and lasting liberation will only come from a protracted struggle organizing the oppressed masses to fight and overthrow the imperialist system. The other major political flaw of In Time is the complete lack of any parallel to the national oppression that inevitably exists under imperialism. In the movie the oppressed and the wealthy are mostly white. There are a few Blacks and people who might be other nationalities among the oppressed, but they all are oppressed equally. National distinctions have disappeared and class oppression is all that exists. While this is a fine science fiction premise, we fear that the Amerikan petty bourgeois audience will see in this movie false parallels to life in the U.$. where workers actually have more in common with the time rich people than the poor in the movie. The reason for this, found in imperialism and the superexploitation of colonial people, doesn't exist anywhere in this movie. And with an audience that likes to consider itself part of the 99% oppressed, this movie is going to reinforce this mistake of ignoring the global context of imperialism. 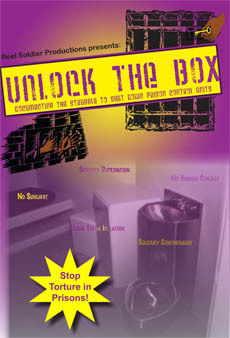 While in prison, people have a unique opportunity of having much time on their hands to study and engage in political organizing. While prison oppression certainly interferes with daily life, the structure of prison and this same oppression enables and in fact encourages political activism. When prisoners are released they face the difficulties of meeting their basic necessities, and dealing with people in random and complex settings, often after years of isolation. And with discrimination against people with a prison record, things like housing and a job can be very difficult to find. Consumed with day to day life issues, it becomes much more difficult for former prisoners to stay active on the streets. As hard as those challenges are, the primary barrier to reaching our goal is preparing people mentally to deal with these challenges and prioritize serving the people. Even those with a stable home and support on the streets struggle to stay politically active. They are often pulled back into street life with their LO. Other times, their free time is taken up by friends and family who have an expectation of consuming free time with destructive behavior like alcohol, drugs, or just wasted time watching TV. Part of MIM(Prisons)'s Re-Lease Program involves reaching out to prisoners well before they are expected to hit the streets, and working with them to build a study program and a release plan. If you hope to stay out of prison and support the struggle after you get released, having a strong political education is a vital piece for staying on track. It is never too early to start preparing for continued activism outside the walls. We've seen too many solid politically active comrades disappear once they get out and are faced with the realities of getting by on the streets. MIM(Prisons) has very limited resources and we cannot offer the kind of release support that is needed in the United $tates. Instead, we focus on working with our comrades who are active behind bars and who show a commitment to stay politically active when they hit the streets. This means we want to work with you now, both to satisfy some general study requirements, and put together a release plan that will help ease the transition to the streets. If you want our support, we need yours. Prisoners who do these things are offered our resources and support to help stay politically active and focused on the streets. Keep in mind that we can't offer housing or a job, but we can provide support, help finding resources, and most importantly a strong tie to maintain political sanity and activism. We work with our comrades to develop a plan for what sorts of political work can be done after release. On the outside there is a lot more freedom to do political organizing, but it's also harder in some ways. There is no longer all the free time there was in prison, and there is not the same level of political interest among the people on the streets. And we know it's hard to walk away from the temptations or difficulties of street life. This program needs help to expand. We need people who are expecting release in the next few years to get in touch with us to work on a release plan. And we are collecting stories from our comrades who have been out and back in about the challenges they faced trying to stay politically active on the streets. This will be the focus of an upcoming issue of Under Lock & Key, so send us your submissions soon! 1. State of Recidivism, The Revolving Door of America's Prisons, Pew Center on the States, April 2011 Report on recidivism for prisoners release in 2004.